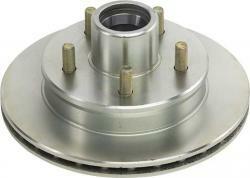 3750#, 9.75" rotor/hub for UFP DB-35 brake system. Rotor includes inner and outer bearings, inner and outer races (installed), and a 2.56" O.D. seal. Hub does not have the threaded hole for drain & fill, made for the "VAULT" lube system.